In the dominant discourse and public opinion, hydropower must be developed for the energy transition and only a few very large dams and hydropower plants in Amsud, Africa and China have very negative environmental impacts. The European Water Movement questions these assertions through examples from France, Spain and the Balkan region. The Balkans are the region in Europe where there are currently the most projects of dams and hydropower plants. The map above shows existing dams and hydropower plants (in black), under construction (in yellow) and planned (in red). This map is taken from a study carried out by Euronatur and River Watch, two German and Austrian NGOs, in partnership with Balkan NGOs. These NGOs led a campaign entitled "Save the blue heart of Europe" which aimed to improve knowledge about the exceptional biodiversity of Balkan rivers, to inform about the threats facing these rivers and to stop projects of dams and hydropower plants on these rivers. These NGOs counted 1640 projects of dams and hydropower plants in 2015, of which 630 are large or medium in size and 817 are in protected areas (national parks, Natura 2000 areas, Ramsar wetlands, etc.). Moreover, they noted numerous violations of European directives and international conventions, while some of these projects are financed by the EBRD and the World Bank. The Balkan rivers are a hotspot of biodiversity. They provide habitats for a multitude of animal and plant species, many of which are endemic, such as the huchen, Danube salmon. The planned dams and hydropower plants will endanger 70 to 75% of the species listed, not counting the many unregistered species. The map above shows in yellow the rivers where the huchen is present and in red the dams and hydropower plants planned on these same rivers. It is clear that the huchen, a migratory species, will disappear if these dams and hydropower plants are built. The situation is particularly dramatic in Bosnia-Herzegovina. The Republic of Bosnia and Herzegovina consists of two entities: the Republic of Srpska and the Federation of Bosnia and Herzegovina. These two entities have a high degree of autonomy. The Republic of Srpska has a centralized system ; the Federation of Bosnia and Herzegovina has a federal system based on 10 cantons. This complex institutional framework and ethnic divisions make it difficult to implement environmental and energy policies that are coherent across the country. There is really no river basin management. A project of dam or hydropower plant on a river is decided by the administration (entity, canton, municipality) after a consultation sometimes marred by corruption and where communities are most often absent. This particular political context results in systematically sloppy environmental and social impact studies. Chinese, Russian and European companies are fiercely competing for the allocation of hydropower concessions. The map above shows the planned dams and hydropower plants in red on the rivers of Bosnia-Herzegovina. These are mostly small structures. The pictures below show what would be destroyed not only by these structures but also by roads and high-voltage lines: not only rivers but also alluvial forests and surrounding wetlands. In 2004, a network of associations was created against these 2 projects. In 2015, following pressure on the Republic of Srpska and the municipality of Banja Luka, the political decision was taken to abandon these projects. In 2016, the consortium that had won the concession is claiming €51 million in compensation before an international arbitration tribunal. A municipality wishing to develop ecotourism around the river complained unsuccessfully against these projects to the Republic of Srpska. An Austrian company started construction of these dams. 2 of these projects are located in the second primary forest in Europe. A petition calling for a halt to these projects was presented in 2016 to the parliament of the Republic of Srpska. Several NGOs from Bosnia-Herzegovina and Montenegro have submitted two complaints in 2018 to the District Court in Banja Luka against the environmental permits for 2 hydropower plants on the Drina river in Bosnia-Herzegovina near the border with Montenegro. Woment of the mountain village of Kruščica and other opponents set up camp on the left bank of the Kruščica River in order to prevent the construction of the dam from starting. According to the Coalition for the Protection of Rivers of Bosnia-Herzegovina, created in 2016, 12 dams are currently under construction by Bosnian, Austrian and Slovenian companies. There are 300 projects of dams and hydropower plants in progress but several projects have been temporarily abandoned due to insufficient funding. 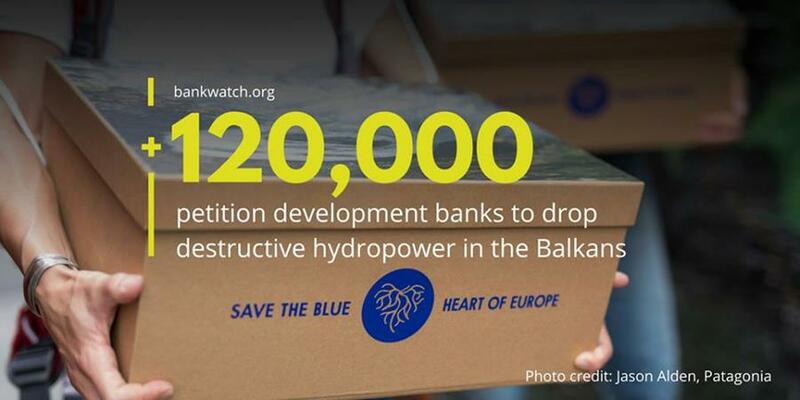 In June 2018, representatives from the "Save the blue heart of Europe" campaign handed in a petition endorsed globally by more than 120,000 people, calling on international development banks (EBRD, EIB, World Bank...) to rein in financial support for hydropower projects in the Balkans.